The following alloys are available: Cu2Ce, CuAu, Cu3Au, Cu3Pd, Cu3Pt, Cu75Mn25, CuNi,CoAl, CoGa, FeAl, FeCr, Fe85Cr15, Fe64Ni36, Fe80Ni20, Nb90W10, NiAl ,Ni3Al, Ni3Al (+Fe), NiFe, Pd97Ni3, Pt7Ni, Pt75Ni25, Pt48Ni52, Pt3Cu, PtCo3, Pt3Cr, Pt10Pd90, PtPd, Pt90Pd10, PtRh, Pt80Rh20, Pt90Rh10,Pt95Rh5, TbCu2, V3Si, W99Re1, HfC, TaC, ZrC, NbC, MoC, TiC, VC, Ag10Zn, Bi2Te3, Co50Ga50, Cu91Al9, Cu75Pd25, Cu75Pt25, Cu70Zn30, Fe98Al2, Fe85Al15, Fe53Al47, Fe85Cr15, Fe86Cr14, Fe82,5Cr17,5, Fe80Cr20, Fe77,5Cr22,5, Fe75Cr25, FeCr16Ni10Mn2Mo2, FeCr17Ni12Mo3, Fe96Ni4, LaB6, NbSi2, NiAl, Ni3Al, Ni85Cr15, Ni80Fe20, Ni70Fe30, Ni3Pt, Pd70Au30, Pd3Au, Pd1Ag, Pd3Zr, Pt3Co, Pt3Ni, PtPd, Pt3Ti, Pt50Rh50, SmCo5, Si50Mn50, Ti50Al50, TiC, VO, W2Re, W4Re, ZrC. Any other compositions available upon request. Please send us details in order to receive quote. The standard orientations offered for the above crystals are for the cubic system (001), (110) and (111) for hexagonal crystals (0001), (10-10) und (11-20). Other orientations such as (117), (221) or (112) may also be produced, of course. The standard accuracy of the orientation of cut crystals is within < 2°. By surface polishing an accuracy of < 0,1° is achievable. Polishing of the different crystals is performed very gently and where possible done chemomechanically. A surface roughness of better than < 0,03µm is obtained. Based on such a polish an atomically smooth surface may be prepared with a few sputter- and heating cycles or by flame annealing. (Recipes for the surface preparation in UHV are available on request). Given an orientation accuracy of < 0,1° terrace widths of several thousand Angstrom are achieved. Metallic single crystals are usually pulled in form of rods. Depending on the metal the rod diameter can be set to values between several millimeters to 100 mm. These rods can be supplied either as raw crystals without further shaping or cut to discs. 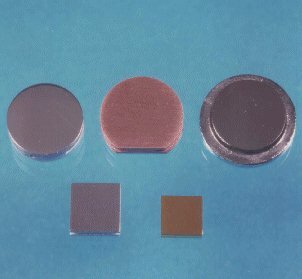 A standard disc thickness is 1mm. Thicker or thinner discs are supplied on request. The crystal geometry is shaped according to specifications of the customer by spark erosion. Special geometries, grooves, holes and reference faces (for instance, to indicate a second orientation) are possible without problems. Below a few common examples are listed. For crystal offers or orders just fill in your desired measures and send us these drawings. - If your design is not included, please fax us your drawing or hand sketch.